FOUNDATION - the idea, the concept, the through line or "spine" of the work. FRAMEWORK - the sorting out of the brain storm. Find the building blocks for the following: Setting, Character, Conflict, Climax, Resolution. Exposition - Tell us what it is we're going to experience or has been experienced already by your characters. Tell us where they are and what they're doing (introduce the conflict). Now for the "why." Guide us up that slope of conflict with some rising action. Introduce plot points that help us understand the character's story trying to resolve the conflict. In the biggest moment, introduce the climax. The point at which we as an audience don't know what may happen to the main character in regard to the conflict because it has just exploded past the expectations of the character and the audience. This does not mean that it must be over-dramatic or violent, but rather is just a culmination of the rising action at a point where the audience has been captured and taken along for the ride through suspension of disbelief. Now for the descent of the falling action. No, it's not over at the climax, now we need to wrap up our story. This can take many forms as we approach the resolution. It could also be resolved with the end result being a twist - something opposite of the expected (i.e. the villain wins, the sidekick gets the love interest, etc.). Now your play is done. So, can you tell this story in 30 seconds? Dialog - this is no longer a quick pitch by a writer, it has actors portraying characters that appeared in your 30 second pitch. Stage directions/emotional notes for your players - give some more details as to how the scene should look. VERY IMPORTANT!!!! Make sure you cover all of the points in the 30 second pitch in this next iteration. The ten-minute play - here we really flesh out the story by laying out the setting in more detail, giving the characters the opportunity to more thoroughly explain themselves either through action or dialog, and through this increase the level of the conflict in the rising and falling action. Don't be concerned, ten minutes is a long time though it doesn't seem so, it is an amazing way to tell a short story in a way that really makes a visual and spoken impact. Back to the basics - Exposition is your friend! Let your characters describe setting, themselves and the conflict through dialog. These things do not necessarily have to happen in the order set here, for example, you can start with conflict and let that define the other two. Act Two - The Confrontation. Some ascending (rising) action is needed here to allow your characters some more depth. 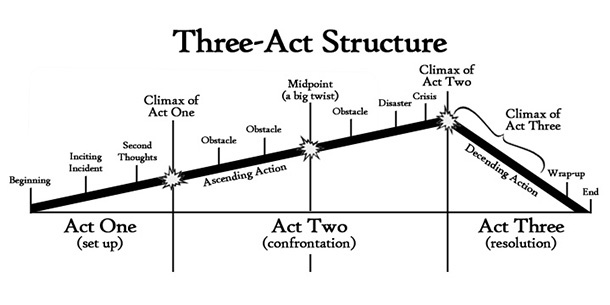 The diagram has three obstacles, a midpoint twist, disaster, and crisis before you reach the end of the act. For a ten-minute script, you may not get to three obstacles or a midpoint twist, but these are great plot devices to keep in mind for future works as well. Act Three - The Descending (falling) Action. With this, your climax begins its resolve, so you can insert the last key truths of your characters. These can come in handy to keep the twists and plot running as the audience speeds to the end with you. Don't forget to wrap up any loose ends you have left (if you want to tie them up.